One of the most famous of our local songs, there follows one version of The Lambton Worm. It was said to lurk in and around the River Wear near the Lambton Estate in Co.Durham. A spot still called Worm Hill is said by most accounts to have been its night-time lair – though the following poem names Penshaw Hill as the location in question. He cowt a fish upon his heuk, he thowt lukk't vurry kwee-a. He had’na mind t’ carry it hyem, so he hoyd it doon a well. An’ aa’ll tell ye aall an aaful story. He joined a band ov nites wee caired for neetha woonds nor scairs. An’ vurry syun forgot aboot yon kwee-a worm in thu well. Wi’ a git big gob, an’ git big teeth, an’ git big goggly eyes. If it felt dry ‘pon the road, it milk’t a dozen coos. An’ swally little bairns alive wen thay lay doon t’ sleep. It craaled away an’ lapp’t its tail ten times roond Pensher Hill. Syunn cross’t the seez an’ reach’t thu ee-as of bowld and brave Sor John. An’ that syunn stop’t it eetin’ sheep an’ bairns an’ lamms an’ caalves. Lost lots o’ sheep an’ lots o’ sleep an’ lived in mortal fee-a. An’ saved thu caalves by myekin’ haalves o’ thu aafull Lambton Worm. Wi' thu aaful Lambton Worm. In 2010, Beamish Museum celebrated its 40th birthday. It is the oldest regional ‘open air’ museum in England. Incredibly, the idea for ‘Beamish’ was first floated back in 1958. It stumbled forward in fits and starts during the 1960s, gradually gathering items of all shapes and sizes from the public which were stored in an old army camp near Brancepeth. In total, more than twenty huts and hangars were filled with material. 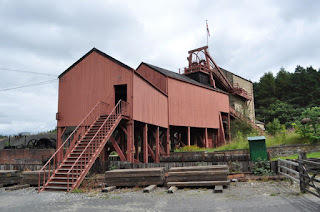 Thanks, primarily, to the efforts of its first director, Frank Atkinson, the project gathered steam, and the collection was eventually brought to its current site near Beamish village in 1970 – the moment when the first staff members were formally appointed and the museum properly born. Even then, the amount of material was substantial, ranging from the smallest household item up to engines, vehicles and whole shops. Such was the enthusiasm for the scheme that a ‘Friends’ support group was established several years before the museum opened. In 1971, the very first public exhibition – entitled ‘Museum in the Making’ – was established in Beamish Hall, and it was such a success that the final go-ahead was given to the concept of an ‘open air’ museum in the hall’s grounds. The following year saw the opening of the site as we know it today – if a good deal shorn of its now familiar attractions. A few cottages were erected in 1972, and in 1973 the railway station and pithead were constructed and the first trams began to run. In the forty years since, Beamish has gone from strength to strength, picking up many national and international awards along the way. It is almost entirely self-funding, and attracts between 300-400,000 visitors per year. If you have ever travelled along the A693 between Stanley and Chester-le-Street, you may have noticed a sign-post pointing south to a village called ‘No Place’. Strictly speaking – and somewhat ironically – it no longer exists. The original No Place consisted of a row of four terraced coattages in the middle of a field to the south of the main road. The very earliest OS maps from the 1850s show them sitting in splendid isolation; then in the 1890s terracing began appearing a little to the north (between the cottages and the road) – a little settlement which came to be known as ‘Co-operative Villas’. In time, the old cottages fell into disrepair and it was decided to demolish them around the time of the Second World War. Such was the affection for the curious old place-name, however, that the residents of Co-operative Villas unofficially took on the name for their own collection of streets. In the 1980s, a sustained attempt was made by the local council to re-impose the name of ‘Co-operative Villas’ on the little settlement, but the locals wouldn’t have it. Such was the strength of feeling that the powers-that-be accepted the status quo … and the place known as No Place now has (officially, it seems) two names. Even the road signs bear both monikers. As is so often the case with these odd-sounding names, no one seems to know for sure quite how No Place got its name. It could be a shortening of North, Near or Nigh Place, or just a nickname that stuck due to its isolation. I’ve also read that the original settlement sat on the boundary between two parishes, neither of which were prepared to ‘claim it’ – hence ‘No Place’! And some even argue that it comes from the reputation of the local pit as being ‘no place to work’. All very strange – but quite wonderful, all the same. The imaginings of our ancestors knew no bounds. Goblins are one such entity said to have haunted the lanes and backwaters of our countryside – and the North-East is no different to anywhere else in the UK. In this part of the world, though, they seem to have been known as ‘brags’, and were able to shape-shift at will, it would appear. One of the most famous of these unearthly creatures is ‘The Picktree Brag’, which was said to have wandered the countryside around this tiny village between Chester-le-Street and Birtley. The most notable account is that given by a 90-year-old woman in the 1830s – as told to local noble Sir Cuthbert Sharp, who handily commited the tale to print. As is so often the case, the ‘brag’ was never seen distinctly, but was more often heard or ‘sensed’ in the dead of night. “It sometimes appears as a calf … or a horse … whinnying every now and then. It also came like a ‘dickass’,” she was heard to say. Others, she exclaimed, saw it as ‘four men holding a sheet’, or as a naked man without a head. It would often accompany the midwife on her rounds in the shape of a horse – and if anyone tried to mount it it would throw them violently and run off, ‘laughing’ loudly. Other northern legends refer to such spirits appearing as a man, an ox or a hound – but it was most often in the form of a horse or donkey, making a terrifying noise, that the ghostly beast would materialise. Strangely, the nearby village of Portobello (a little to the north) also harbours a similar legend. But I mean, come on, let’s be reasonable … it’s probably the same creature ‘doing the rounds’. Common sense, really.